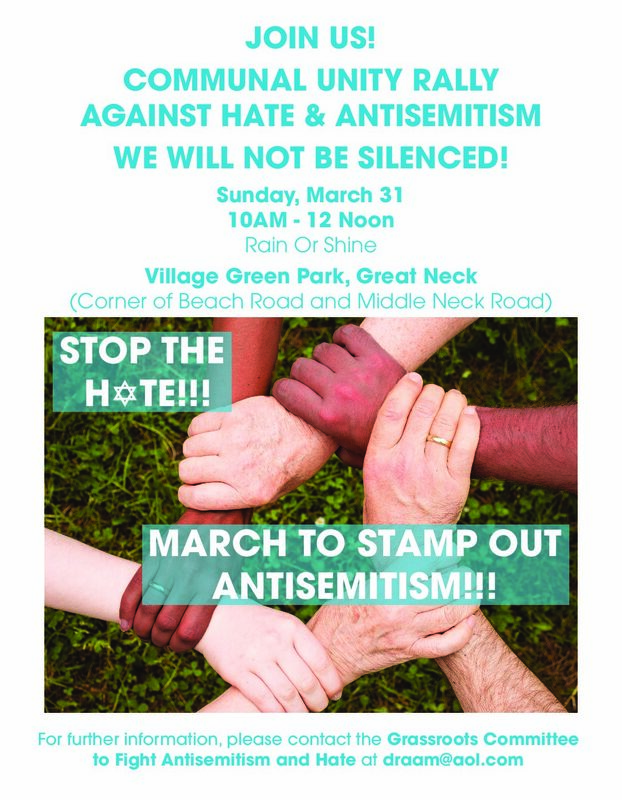 A rally against hate and anti-Semitism is planned at the Village Green in Great Neck Sunday morning in response to what some have seen as poor political leadership in speaking up against anti-Semitism. The scheduled rally specifically comes in the wake of comments from U.S. Rep. Ilhan Omar (D-Minn.), who has been under fire for remarks about Israel, including a suggestion on Twitter that pro-Israel sentiment among lawmakers was motivated by donations from AIPAC, or the American Israel Public Affairs Committee. Alan A. Mazurek, a retired neurologist and one of the grassroots organizers of the rally, said he and many others were “very disturbed by all the anti-Semitic utterances.” He was hoping that leaders would call for some type of action whether it was a rally or mass campaign or letter writing. Mazurek said he has reached out to various groups, including religious leaders throughout Great Neck, the Persian Jewish communities, the Chinese-American community and Long Island lawmakers and Great Neck mayors. Nassau County Executive Laura Curran will also be in attendance, he said. “We’re crossing all lines,” Mazurek said. Mazurek also said this is an issue relevant for everyone, because while history shows Jewish people are often the first to be targeted, they are not usually the only ones to be hit. “This has become an issue for the entire community, not just Jews,” Mazurek said. The rally will also come amid an increase in hate crimes overall, FBI data released late last year suggests. Reported anti-Jewish incidents spiked by more than a third from 684 in 2016 to 938 in 2017 nationwide, according to the FBI, driving up hate crimes by 17.2 percent overall. The Anti-Defamation League’s data also found a similar story, with 1,986 anti-Semitic incidents recorded nationwide in 2017 – a 57 percent increase from the 1,267 recorded incidents in 2016. The rally will be on Sunday, March 31, and last from 10 a.m. to noon.